The Transom doesnt look bad! I am pricing her to sell as I just don't have the time. I will accept £3000 as she is. Though she needs some work She is largely pretty good. Endil The name is that of a Scandinavian Sea Deity one of the Kings of the Sea. 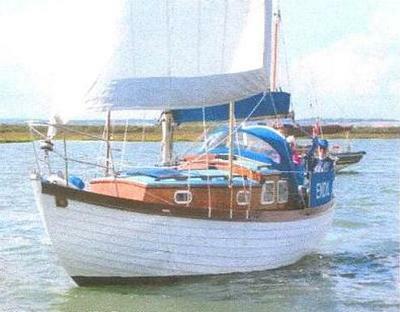 She is an Oakleaf 28 Built for the East Coast of the UK by Sutton and Smith in 1972. Well built and workmanlike in her appearance. The boat has been left closed up and there is some wood problems on the stem, a little on the transom and a soft area on the side cabin. Otherwise apart from this and some maintenance she is pretty good. I have inquired the cost of the work from a good boatyard that specialises in wood. I may yet decide to do the work myself. She has a centre plate so will float in 3 foot but draws 5 when the plate is down. Endil is for keeps then? There you are! No longer available NB! HENRY TUDOR - ! Handsome indeed! BUT - NB. Sorry this ad is no longer available. Yacht HENRY TUDOR built by Sutton & Smith - laid up for winter, located currently in a boatyard at Woodbridge, Suffolk, IP12. 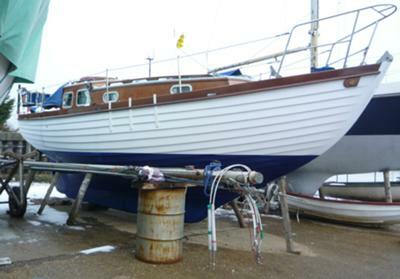 Stunning clinker-built wooden boat for sale. Drop keel ideal for coastal sailing and estuaries (draft 1.49metres). Been in my possession since 2002 and had at least £25k+ amount of work done over the last decade - probably more. Now 40 years old but as good as when she came from the boatbuilders. 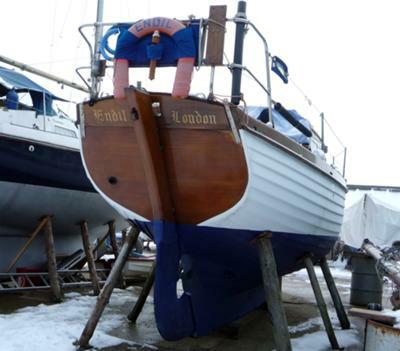 New engine (only done 150hrs), new rigging, new decks, new keel bolts, new head - you name it we've had it done and all top sides, anti fouling and varnish all completed in July 2012 by Robertsons boatyard in Woodbridge, Suffolk - you couldn't wish for better workmanship. Sadly I have a genuine reason for sale and this is a reluctant sale - probably the best kind for buyers. I'm sure the first viewer will buy. Draft Min 0.91m (3'0") Draft Max 1.75m (5'10"). Engine is pretty powerful for size of boat - it's 3.75HE 3 cylinder sea water cooled Nanni diesel. Very responsive when needed to get out of trouble and capable of cruising nicely at 7-8knots at medium throttle. Yes she's laid up for the winter - engine winterized/serviced - and that's all paid for and included in asking price. I bought Henry Tudor in 2002 and had her surveyed then. A copy is available for inspection as are the receipts for the work that was recommended to be done. I haven't had her surveyed since, but Robertsons of Woodbridge did all the work and have looked after her ever since. The drop keel works by a winch and pulley system and is operated from the cockpit. It definitely works - the plate was anti-fouled before she went into water last spring. Legend has it that the teak used on Henry Tudor came from an Odeon cinema stage where the Beatles once played. That information came from one of the chaps who worked at Sutton & Smith in the early 70s. Comes FULLY EQUIPPED: VHF radio, depth sounder, anchor, ropes, fenders, all galley equipment (plates saucepans), cooking utensils/cutlery, lifejackets, seat cushions, fenders, lockers full of ropes, sail cover, cockpit cover - she's ready to sail off into the sunset. Headroom in the main cabin: I'm 6ft and can walk around in my shoes without having to stoop. 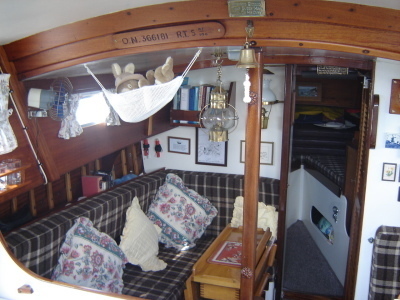 Sleeps five, galley with calor gas cooker - two rings, grill and over. Cold water sink - but there's a kettle. Head/flush toilet - but no shower. Equipment - depth sounder, VHS radio inc. Main sail and gib/genoa and spinnaker. She's perfect. Sad to see her go.. I very nearly bought endil early in 2012 & a price was agreed, but I backed out at the last minute. The reason, when I looked her over,the boat was full of water nearly up to the floors, fresh water I may add although it had been covered over the cockpit. I was informed by the boatyard, that the decks leaked. Thinking back I think the water came from the cockpit via a not very good cover. I may add that I thought she was a great boat, & the layout was one of the best I've seen. As for the rot, it was a good diy job. I should have bit the bullet & bought her. Can anyone tel me if they built a 26ft version? I'm trying to identify my boat 'Clochard' which looks very similar & has lived most of it's life around Maldon/Heybridge end of the world. Mine seems to have had the cabin extended right up to the rubbing strake so to go forward it's an "over the roof job" although its wide & flat enough to make a safe working platform. Does anyone have any information about a Great Wakering Oakleaf named "Henry Tudor"? Just to say - I owned a sister vessel of the class for over a decade. Sold simply 'cos health problems made maintenance difficult. A grand ship, a delight to sail and well worth your effort to keep sailing. I knew ENDIL from 'eyeballing' her often and she was always immaculate. Hi Mike, many thanks for your comments, she is a lovely boat. I feel the work is not beyond my skills, I have just about decided that I will do the work myself. As you point out part of the problem of getting it done by a boatyard is sticking to time, or even completing when it is started. Though the one I had discussed repairs with has a very good reputation. The other is the crippling costs of work. And you are right getting to know your boat is part of the journey. She looks like a gem, proper little ship. I can also appreciate your dilemma over the repairs. My personal inclination would be to do it yourself. It won’t necessarily save you either time or money but you will get to know your boat more intimately (the wife/partner permitting) and expand your skills, personal enrichment and satisfaction, etc, etc. But that depends on your own belief in your competence to do it right (you might be surprised at what you can do when you put your mind to it). On the other hand the professional (hopefully competent and honest) will have all the necessary tools and the skills to do a good job quickly (that’s assuming that they will give you a time, date and stick to it?). You could compromise by doing any simple repairs yourself first seeing how you get on and perhaps leaving any structural or difficult bits for the professionals.